MADISON- High-tech flu surveillance within clinics can accurately track, in real time, early flu activity, peak season and the end of the flu season, according to University of Wisconsin School of Medicine and Public Health researchers. 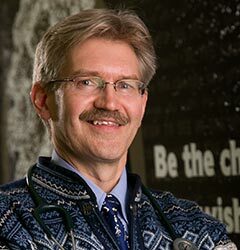 The study, led by Dr. Jonathan Temte, professor of family medicine and community health, with the help of the Wisconsin Research and Education Network (WREN), recruited 19 primary-care clinics across Wisconsin to participate from September, 2013 to June of 2014. An analyzer (a lab instrument that can identify the content of specimens) and a wireless router were installed in each clinic and more than 250 clinicians and clinical staff were trained. Providers were asked to identify patients of any age who presented with acute respiratory infections, despite the reason for the visit. More than 1115 patients provided a nasal swab and the specimens were sent to the on-site clinical laboratory for analysis. The analysis takes 20 minutes and the results of the rapid tests were confirmed by the Wisconsin State Laboratory of Hygiene. There were 251 influenza A-positive and 62 influenza-B positive tests. The analyzers, equipped with wireless transmitters, sent anonymous test-result data to a global wireless surveillance and remote instrument data-management system. The system provides a near real-time database with information including date and time of testing, patient age and results of influenza A and B testing. The data were automatically compiled and sent to the surveillance team every day. Temte said the novel surveillance system provided extremely early detection of the seasonal flu outbreak, providing clinicians an opportunity to intervene early with their patients. The results were published by the Journal of the American Board of Family Medicine.